With summer comes spontaneous pick-up games. And one of North America’s favorites: basketball! Basketball is a sport that requires quick transitions and lateral movement. The fast pace, explosive actions, jumping, shooting and quick transitions of basketball seem to be in a totally different physical dimension from yoga. It begs the question, can you improve your basketball game through yoga? Definitely! When tailoring your yoga practice to help you compliment your favorite sports, it is important to take into account the types of movements most often associated with it. What is the speed of the sport? What postures or positions do we find the body in while playing? What areas of the body that might get stressed or strained on account of these movements? The next step is to think about stretches that can release these areas of the body and poses that might strengthen them. Looking at the components of great basketball players, we can peel away the layers of movement and use yoga asana to enhance skill in the game. In playing basketball, it is necessary to have strong legs for explosive action and speed down the court. The IT bands can become stressed or strained from sideways movement. Ankles can get easily rolled from the quick agility often displayed by the best players. Here are a few yoga poses to address each of these aspects of your game. Forget heavy weights that can make you susceptible to further wear and tear or injury, there are loads of yoga poses that can help strengthen the legs and quads. Any Lunge, Warrior 1, or Warrior 2 (pictured) will help strengthen the legs leading to improved stamina and speed. Tight IT bands can lead to knee pain and challenge the movements necessary for the game. Many yogic twists are super helpful in stretching the IT bands; Twisted Triangle Pose, Twisted Half-Moon (pictured), and Supine Twists with the legs straight in a scissor position will all help to release these. It is hard to avoid rolling an ankle, but it is possible to stretch and strengthen the ankles in order to lessen the risk of injury. Many different pose variations stretch the fronts of the ankles. Downward Facing Dog stretches the Achilles. Standing balances will be tremendously helpful in strengthening the ankles! 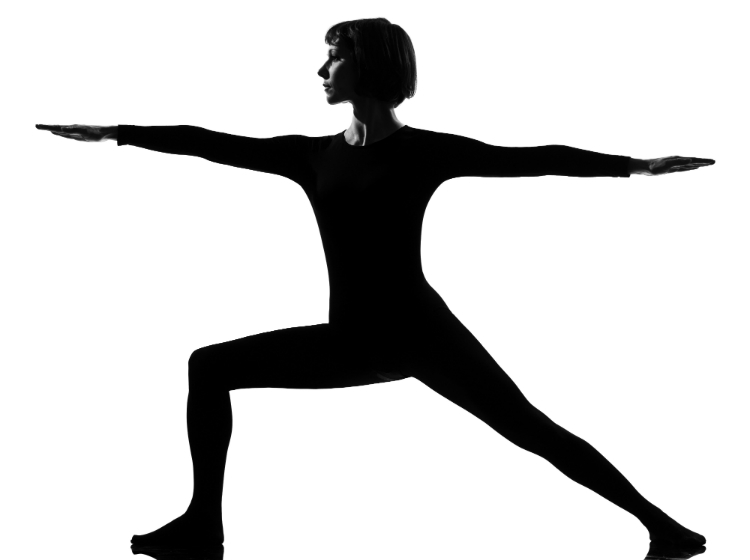 Try Tree Pose, Eagle or Extended Hand-to-Big-Toe Pose to strengthen the ankle of the standing leg. Stay cool while you're hitting the courts this summer and keep these poses in mind for a quick stretch before and after your game. Your knees, legs, and ankles will thank you!